The goal of Immersive Field Recording is not only to provide recordings and material, but to also educate and explain the basics of Spatial Audio, and how to process and manipulate these complex audio streams. 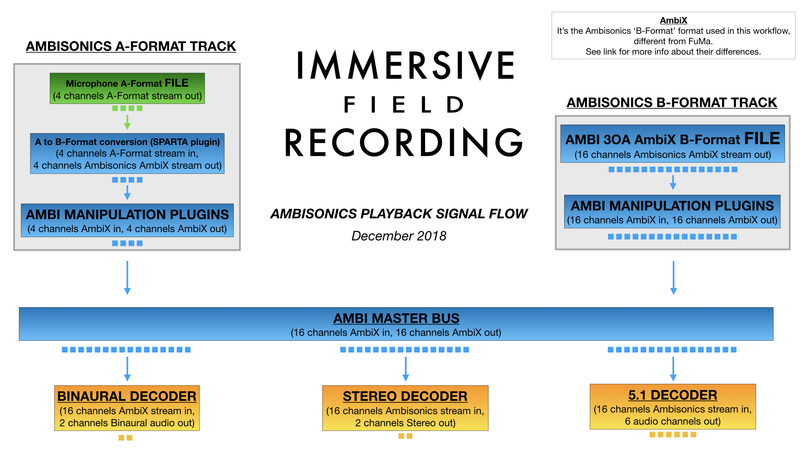 There are two ways to playback the Ambisonics audio files provided by Immersive Field Recording. To simply play the audio files for headphones, only the latest version of VLC can be used, as it included an Ambisonics decoder. Download VLC here, and make sure to change the settings as shown on the GIF below. Note that only B-Format files can be played with VLC, no A-Format! A FREE, but more advanced workflow, is shown below, where you can manipulate the Ambisonics soundfields, and also decode it to various playback systems, from mono to stereo, 5.1, 7.1.4. Well, there are various solutions, some more difficult to use, some more accessible, and more expensive. As, ideally, ANYONE should be able to listen to these recordings in the easiest way, following you can find a Reaper template (free evaluation copy) which uses only free plugins to decode the Ambisonics audio stream. Below the signal flow workflow, where the dots represent the number of audio channels per track. First of all, let’s download some software. Make sure to download the latest version of each software, for the right platform (Windows or Mac). Please install this software in sequence. Download and install Reaper, the DAW. Download and install the Blue Ripple O3A Core plugin bundle. Download and install the Soundfield By Rode plugin. Now follow the steps below, which show how to setup Reaper correctly and how the template works. Launch Reaper and setup the playback device. Make sure you select the ‘default system device’ under Preferences, as by videos below. If in the Menu Bar you see ‘closed device’, it means that the playback device hasn’t been set up correctly. Follow the video below to change to the correct one, for either Mac or Windows. At this stage, Reaper is ready to use. It’s time to use the ‘Immersive Field Recording – Ambisonics Playback template V1’. First of all, uncompress it, then open it, as shown below. There is no need to import any files for now, as the template has some sample files already loaded. But if you want to listen to other Ambisonics audio files, you can import audio files by drag and drop or by importing them using the option in the Menu Bar. By browsing for the specific file. By browsing an entire folder. In any case, make sure the box ‘On failed search, leave file offline and auto search for other missing files’ unticked. In case Reaper doesn’t find the file, it will ask you to select another folder. The videos below show how to create a selection, and ‘solo’ a track. In the ‘Immersive Field Recording – Ambisonics Playback template V1’ all the decoded tracks are muted, this means that to preview one of them, this must be soloed. FB360 Spatialiser. With this plugin, it’s possible to change the soundfield rotation in the vertical plane or up-down (Pitch), in the horizontal plane or left-right (Yaw, the most used one) and tilting (Roll) it. The Envelopment controls the diffuse field of the sound. It’s advisable to keep it on the default amount. Blue Ripple Sound ‘Flare’. This plugin is a visualiser for the soundfield. It shows what is happening sonically in the soundfield, represented on an equirectangular grid. The ‘Immersive Field Recording – Ambisonics Playback template V1’ has various decoding outputs, depending on the user needs. Binaural Rendering: it decodes the Ambisonics audio stream to the left and the right channels, simulating the shape of your head. To do this the FB360 Control plugin is used. The parameters can be left untouched, as it is a plugin mostly used for 360 video production. Stereo Virtual Mics: it decodes the Ambisonics audio stream to two-channel stereo, by creating two virtual microphones. The Blue Ripple Sound’s ‘O3A Virtual Microphone’ let the user change the polar pattern and stereo width of the virtual microphone pair, depending on the needs. Mono Virtual Mic: it decodes the Ambisonics audio stream to a single mono channel stereo. This can be useful when the user wants to extrapolate one single source from the entire soundfield. Just grab the green cross and point it to focus only on one part of the sound field, it’s like using a ‘virtual shotgun mic’. The Ambisonics audio stream can also be decoded to any loudspeakers array. 5.1 Loudspeakers: it decodes the Ambisonics audio stream to a 5.1 loudspeaker system, using the Blue Ripple Sound’s ‘O3A 5.1 decoder’. The channel outputs are the following 1. Front Left, 2. Front Right, 3. Front Centre, 4. LFE, 5. Surround Left, 6. Surround Right. 7.1.4 Dolby Atmos: it decodes the Ambisonics audio stream to a Dolby Atmos 7.1.4 loudspeaker system. The ‘Soundfield by Rode’ plugin is used, and it lets the user also convert to other formats, such as 7.1, 5.1, 7.1.2. The downside of this plugin is that it works with 1st Order AmbiX only, meaning that when this is used all the high-quality spatial information from the 3rd Order AmbiX gets lost, resulting in a poorer decoded soundfield. It is advisable to download the Dolby Atmos package available, as it is decoded using an advanced upsampled algorithm that recreates high-quality spatial resolution. Below a video which shows how to route the channels correctly from Reaper. An ‘A-Format playback’ track is also available, in case the uses would like to do the A to B-Format conversion. Unless specified on the file name, most of the Immersive Field Recording Ambisonics files are provided already decoded and upsampled to 3rd Order AmbiX, which means there is no need to do the A to B-Format conversion. If there is any problem, or you think that this guide can be improved in any way, please drop an email to info@immersivefieldrecording.com, it would be much appreciated!